The Warrensburgh Central School was constructed in 1942 and is a highly intact and distinguished example of mid-20th century Civic architecture executed in the Georgian Revival style. Features of the 2-story, brick, L-shaped building include full-height portico with fluted columns and roof-line balustrade, pedimented door surround, overall symmetry and oversized six-over-six sash. 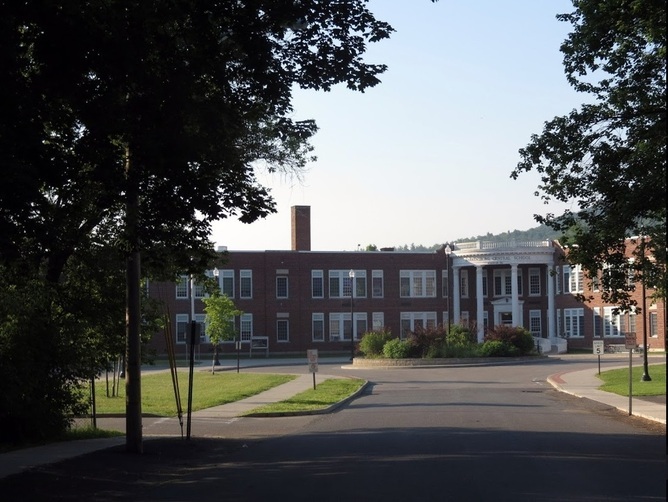 The Warrensburg Central School District was established on June 16, 1938, offering kindergarten through high school education to all children in Warrensburg, most of Thurman, plus nearby parts of Caldwell (Lake George) Chestertown, Bolton and Stony Creek. 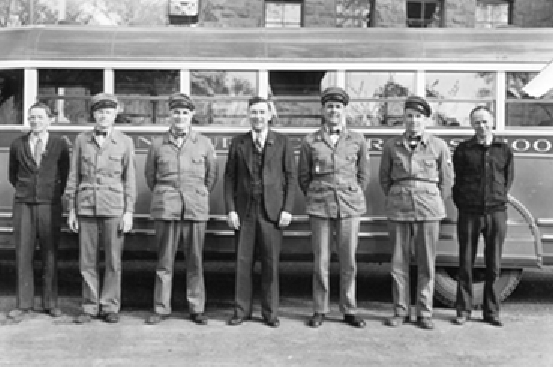 It was at this time that a fleet of buses was purchased. Not every local district school serving the elementary levels was closed immediately, but all high school level students were transported to the central building at Elm and School (now Stewart Farrar) streets. To handle the expanded student population several classes were held in rented space at the Odd Fellows Building. The new Central School Board of Education, composed of President Walter H. Pasco, Don Cameron, Howard Hull, Ralph Brown and Dr. Arthur J Cunningham, began the process of determining a site for a new building. In June 1941, five contracts for the construction were awarded for the Elm Street site, which had been donated by Mrs. Grace Lown (later Magee) more than ten years prior, in 1929. Ground was broken in July 1941. J. Russell White was the architect and Mark Cassidy did the landscaping. Cold winter weather and building material shortages due to the Japanese attack on Pearl Harbor delayed construction. On October 11, 1943, the new building, housing kindergarten through twelfth grade, was dedicated. For the first time the school had its own athletic field and a gymnasium. By 1951 the building was again filled to capacity and the kindergarten had to be held off site. In 1955 an extension of the east wing added nine new classrooms. By 1962, with five classes held off site, the district appealed for more space. Subsequently, in 1965 a large addition was built off the west wing. By 1975 a middle school was created at the former BOCES site on Horicon Avenue, which the school district purchased in 1976.